Welcome a collection of artifacts from Manned Spaceflight. Please enjoy yourself. Now for the small print, all photographs and written words are copyrighted under US law. Please contact me at mcglynn@aol.com for permission to use any and all photographs and wording from this site. I boarded a plane last Saturday for a busy trip across the State of Arizona. 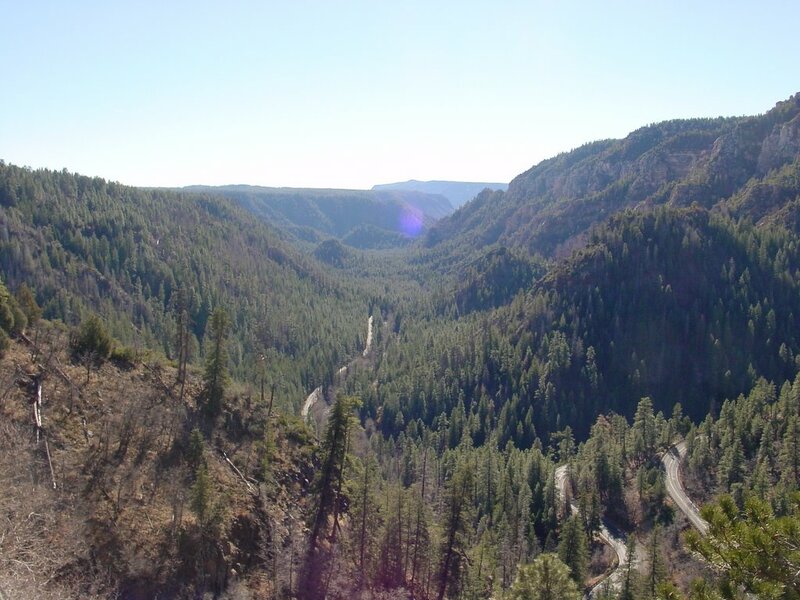 My travels took me from the top of the state near the Grand Canyon to the bottom of the state near the border of Mexico. 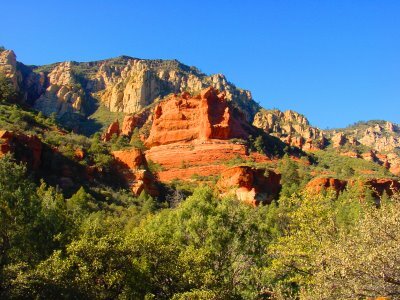 In the four days of driving I learned the Arizona is a truly unique and wonderful state. As soon as I landed in Pheonix, I was on the road for a three hour drive north to Flagstaff. 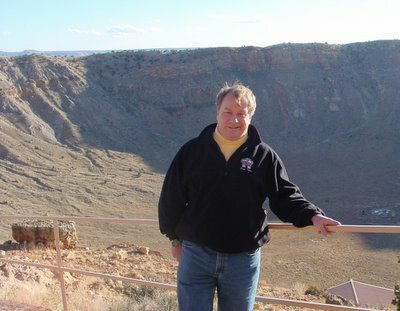 My trip would bring me in contact with the Meteor Crater and the Skylab I astronaut, Paul Weitz. I passed right through Flagstaff on the first day and headed for Meteor Crater. A crater famous for it's youth (in geological terms) and as a training ground for astronauts destined to walk on the Moon. 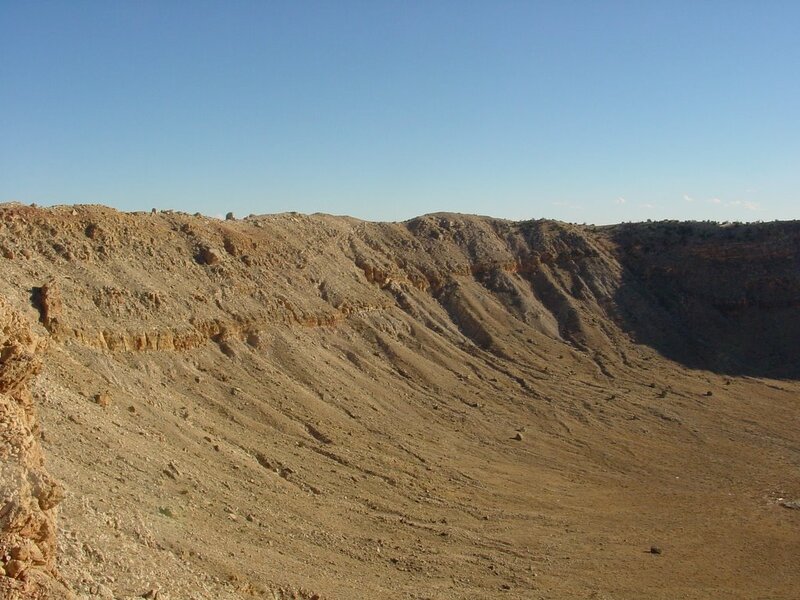 Meteor Crater is approximately 40 miles east of Flagstaff. After a traveling on a major highway, there is a turn off onto a narrow road that takes you the final 6 miles to the crater. 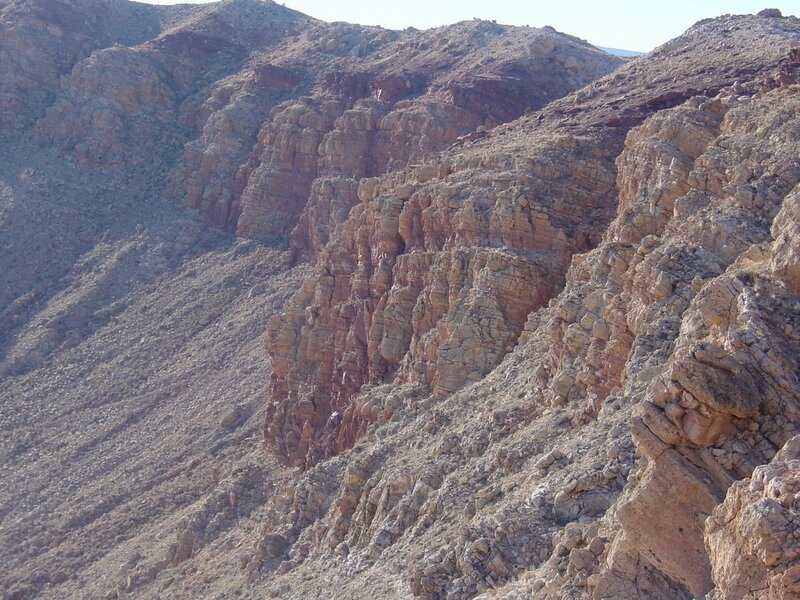 The crater rim materializes as a row of hills rising up over 150 feet above the floor of the upper plateau of Arizona. There are no visual cues to provide scale within several miles of the crater itself, which gave me a real life lesson in estimating distances. 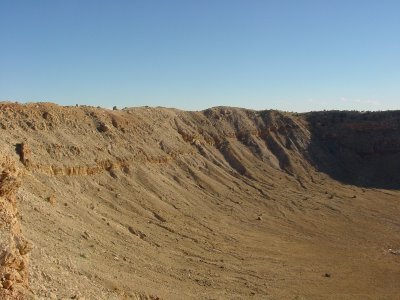 The above panoramic photograph shows the far southern face of the crater and attempts to provide an idea of the bowl created by the initial impact of the meteorite. 50,000 years ago, a iron meteorite weighing 300,000 tons struck the high plateau at a speed reaching an estimated 40,000 miles per hour. The impact is compared to the explosion of 20 million tons of TNT and moved an estimated 150 million tons of sandstone. 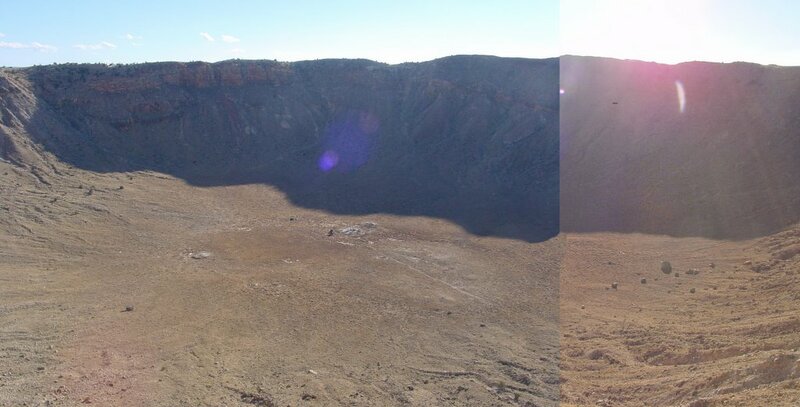 The far side of the crater is approximately 4,000 feet away for the vantage point of the camera. The bowl is over 500 feet deep. While I was standing on the rim, I called my wife (I could get cell phone service on the rim of a crater in the middle of nowhere and I cannot get cell phone coverage in my home). During our conversation, I was describing the crater to her and estimated the measurements at almost 900 feet in diameter and 150 to 200 feet deep. After talking with her, I went into the museum and found out what the real distances were of the crater. I came to a better understanding of what problems the moonwalkers must have had estimating distance and size of rocks and craters during their navigation on the lunar surface. Towards the end of the day the sun highlighted portions of the eastern wall of the crater. A sheer cliff can be seen approximately one third of the way down the crater wall. That appears to be the ground level of the plateau where the impact occurred. The meteorite threw up an overlapping rim of rock that towers above the plain. 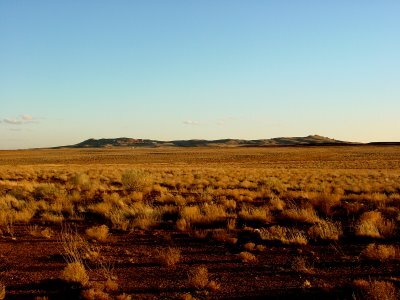 To get a sense of scale, if you follow the ridge of the crater from the left of the photograph, there is a rock standing on the top of the rim. That tiny speck is called House Rock, because it's size is representative of the average home. The lower portion of the wall is a gentler slope (still very steep) of debris and talis that have eroded toward the bottom of the crater. There are gullies in several places caused by erosion. In this close up of the northwestern side on the crater wall the shocked and uplifted sedimentary layers are shown in greater detail. Beyond that point, the earth was ejected by the impact of the 300,000 ton meteorite forming the rim and blanketing the plains beyond. The sedimentary layers, so prevalent in this photo, were caused by the sinking of sediment to the bottom of what was once a large inland sea. There are still marine fossils found at the site in the layers. Another interesting item that you can find on the rim is sandstone that was so shocked by the impact that it was turned into a fine powder that feels and looks very much like talcum powder. I did have to play tourist while there. I know the museum staff knew they had a "mark" when they saw me coming through the door. I found out that the museum does not sell remnants of the actual meteorite. The curatorial staff values that actual nickel-iron fragments at $2,000 dollars per pound, so I was really glad I bought my 2 pound fragment awhile ago. Still, the museum sells iron oxide fragments and I left the crater carrying a few extra pounds of rocks more than when I arrived. I spent most of the afternoon at the crater just marveling at it's size and didn't leave until the sun was setting and the shadows had filled the bowl. Meteor Crater is definitely a place to visit if you are a space enthusiast. On Sunday morning promptly at 8AM, Paul Weitz met me for breakfast at my hotel in Flagstaff. Paul, who was the Pilot of the Skylab I crew and the Commander of STS-6, graciously agreed to meet with me to certify some artifacts that I had purchased from him via the Swann Auction of 2005. We had a very pleasant chat during breakfast. We discussed the Navy, Space collecting and Paul's flights and subsequent position as the Deputy administrator for JCS. 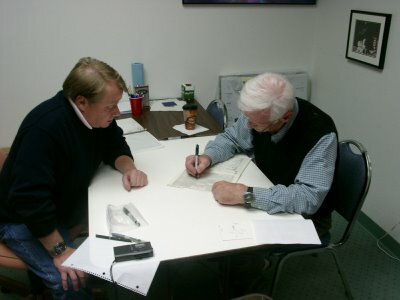 After breakfast, Paul and I went back to my room and we sat down to work on the certifications for several artifacts flown on Skylab I from Paul's collection. The above photograph shows Paul holding one of his flight suit name tags. The name tag is made of beta cloth with Velcro stitched onto the back of the tag. Paul talked about the flight. We also talked about the mission numbering system that NASA used and has become so confusing. The reason for the discussion was due to our attempting to figure out what exactly to write on each item for a mission number. Paul said that the missions were numbered by NASA starting with the launch of the unmanned space station, Skylab. Then each manned mission was to use the Roman numeral that represented the order of their mission (i.e.. Skylab I, Skylab II and Skylab III). Unfortunately, Skylab 3 used the Arabic numerial instead. Which has caused confusion ever since. 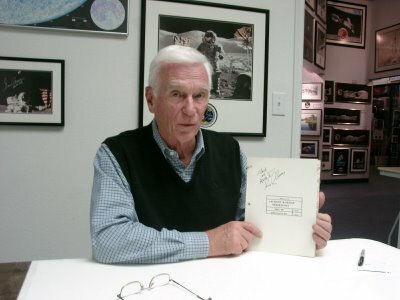 We agreed to have Paul write Skylab I (SL-2) on each artifact. One of the artifacts, I did purchase was the hairbrush Paul used aboard Skylab I. One of the photographs we took was a "tongue in cheek" picture of Paul actually using the brush. There was hair in the brush that was actually from the time the brush was used on the mission. I told him that I was going to sell the hair at auction and capitalize on the current controversy about the sale of astronaut hair at auction houses. We went over several other artifacts related to Skylab I as well as covering a lot of ground about the workings of NASA, autograph shows and Flagstaff. We finished up about Noon. 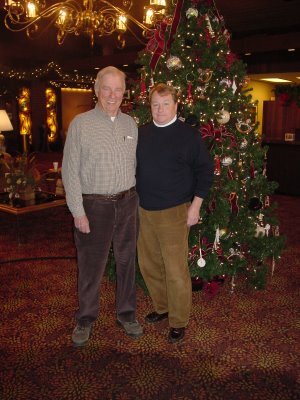 Paul and I walked back down to the lobby, took a picture together next to a Christmas tree and Paul was on his way. 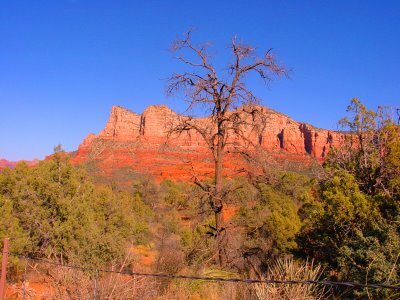 A few minutes later, I was on my way south to Tucson by way of Oak Creek Canyon and Sedona. 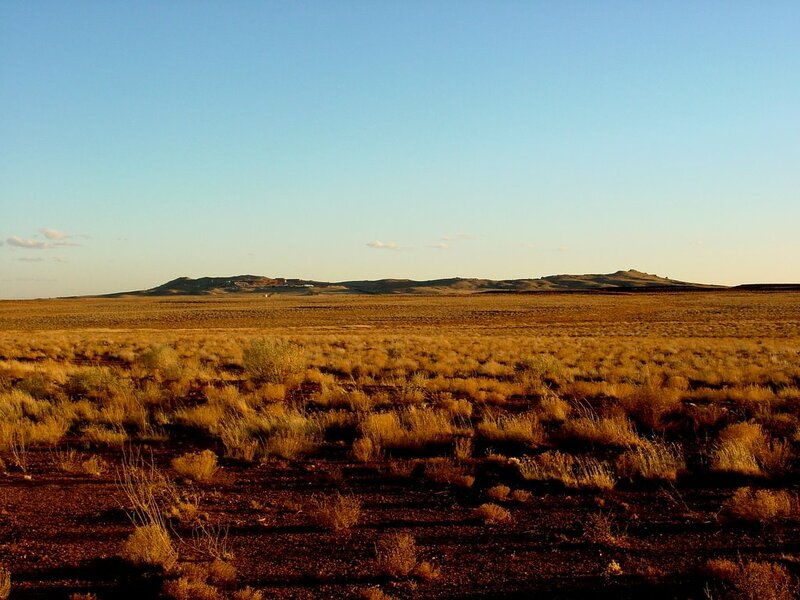 Arizona is the land of the vista. I left Flagstaff behind, which lies on a plateau at an elevation of 6000 feet, and headed south towards Sedona. A short time later I was greeted by the sight so feebly shown in the above photograph. The picture attempts to show the entrance to the Oak Creek Canyon, which spreads out before you as far as the eye can see. The small road that snakes in and out of the photograph is Route 89A. The road drops you from 6000 feet where this picture was taken to 4000 feet where the road disappears into the distance. It is a very rapid descent to the bottom of the canyon. I cannot adequately describe the beauty of the area. 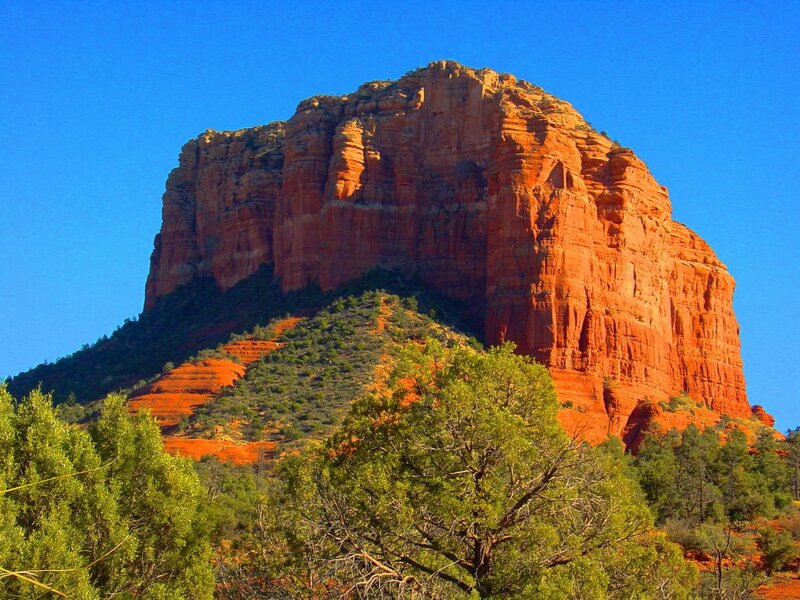 One of the sights that really struck me was the bright red colors of the sandstone that is so prevalent in the Flagstaff area. There are vast tracts of tall Ponderosa Pines growing on top of pink soil. The color in the region is spectacular. The above photograph shows one of the many rock formations created in the canyon by the flow of water over the ages. The top layer is a sandy brown followed by several layers of deep red sandstone, which stand out in contrast to each other as well as the green of the pine trees that are interspersed throughout the area. Again, I played the tourist. How can you not be one of those idiots that stop in the middle of the road to take a picture of a view of the canyon like that shown above? It is truly breathtaking. The water has sculpted the red sandstone in to unique shapes that stand alone as sentinels throughout the canyon like layered sandcastles. I know it sounds hokey, but I had never been to such a place of such stark beauty. 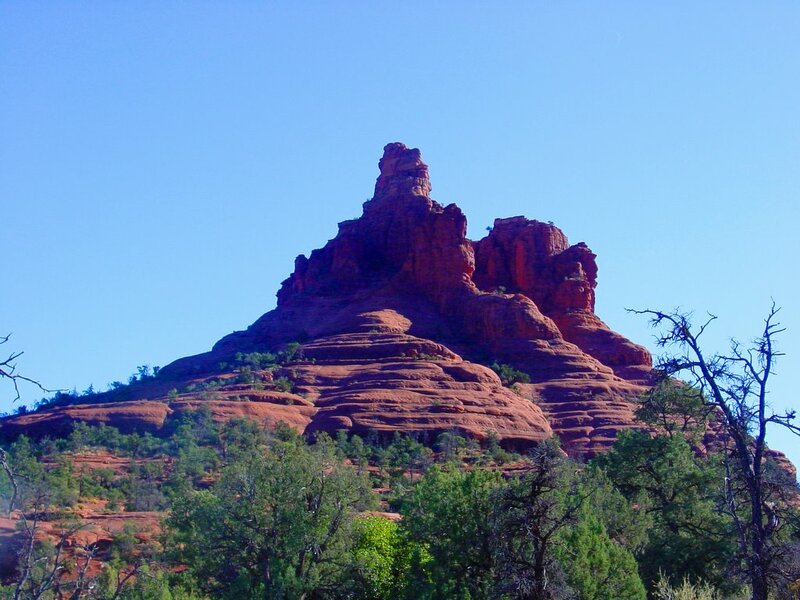 As the canyon flattens out into the desert like conditions of the lower plains at around 3,500 feet, there was this last lone stone tower that is named "Red Rock." You pass this last chunk of rock and then you drive out onto wide sandy plains of low brush. Then Route 89A merges back onto Route 17 and you are headed south toward Pheonix and further south into the desert towards Tucson. Sunday night I arrived in Tucson and checked into my hotel for the night. By Monday morning, I was on my way to visit Dr. William Hartmann, Senior Scientist at the Planetary Sciences Institute. 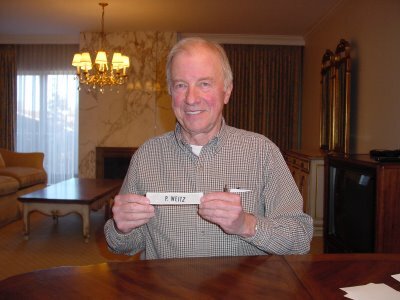 Space collectors may know Bill from the several books he has authored. 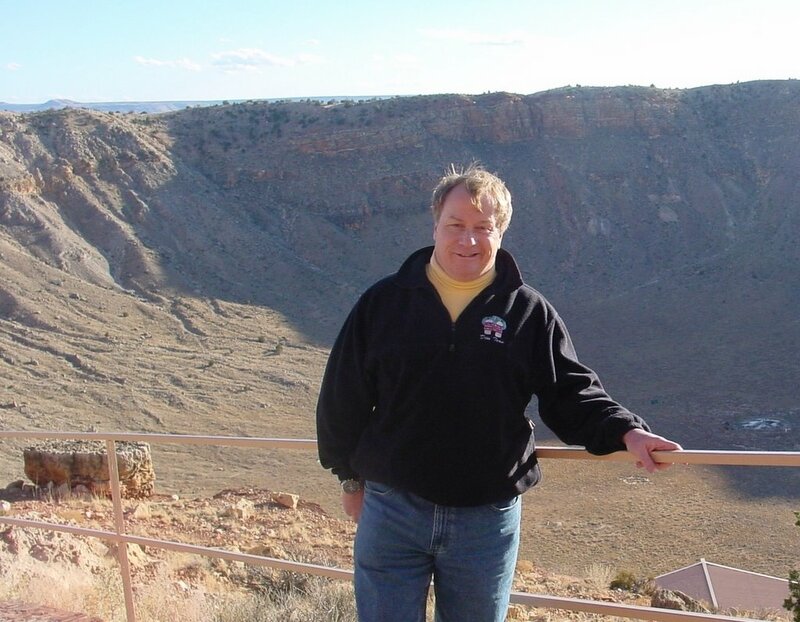 Bill is a prolific writer as well as an accomplished artist, who has written and illustrated several popular books like "The Grand Tour," "Out of the Cradle," and "A Travelers Guide to Mars." I met Bill at his studio around 10AM and I received a tour of his studio located just behind his home. 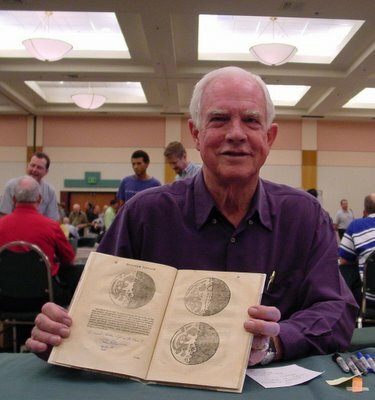 It is filled with the artwork of many other astronomical astists like Pamela Lee, Chesley Bonestell and Ron Miller. I was at his studio to see the latest in a series of commissions on the birth of the Moon. 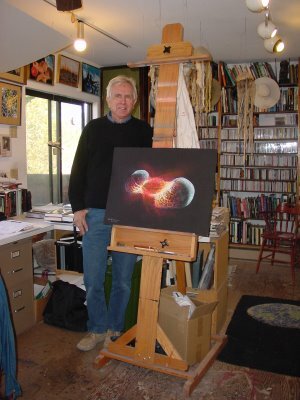 Besides being an author and artist, Bill is a planetary geologist of some renown having originated the theory on the origin of the Moon as well as the origin of basin forming impacts on the Moon. 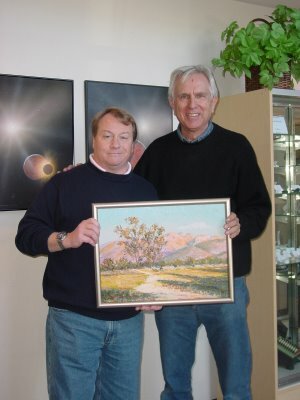 The painting above shows Bill with the latest commission that shows the state of the Earth and Moon some 40 minutes after the initial planetisimal impact. After the tour of Bill's studio, we drove through the suburbs of Tucson to PSI's main offices. As a PSI donor (all donations are welcome), I received the dollar tour of the building. Bill and I posed for the camera in the main lobby of their new building. I added that southwestern landscape painting to our art collection. By the way, the two paintings directly behind us are also paintings done by Bill of various stages of the impact that created the Moon. They were done for magazine covers and are for sale. The prices are very reasonable and all you have to do is contact Kim Poor at Novaspace (Bill and Kim, you owe me for the plug) and he will make all the arrangements. After our meeting, I headed over to Novaspace and found Kim, Sally, Linda, Lisa, Stephanie and Rob busy at work getting ready for the Cernan signing that was happening on Tuesday morning. Kim and I traded war stories until about 5PM (and yes, I found a beautiful Bob Eggleston original painting of the Earth in the gallery that now resides on one of the few remaining walls in my home) until Gene Cernan arrived at the studio to help me certify several artifacts purchased from Gene since last year. Kim afforded me the chance to sit with Gene for about three hours to certify various items from my collection. We sat and discussed many topics that ranged from Gemini 9, Apollo 10 and Apollo 17. The one thing that struck me about Gene was his memory of events on the lunar surface. We talked about the fact that 33 years (to the day) had elapsed since his launch on Apollo 17 and sometimes memories of specific events fade with time. Gene was very good at responding to my questions. It impressed me that he had such good recall. Gene took the time to pose with some of my purchases from his collection. The above photograph is of a complete flown Apollo 10 lunar module checklist. I cannot thank Gene enough for the time and effort that he spent with me. On an aside, Gene looked very good and was really chipper during my time with him. He was a riot at dinner. The whole evening was very educational to me. I learned a great deal. 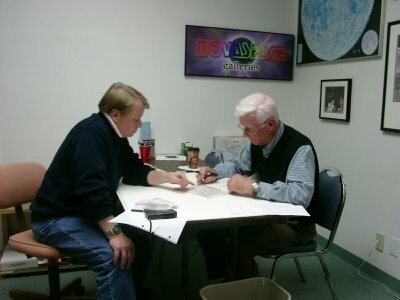 Gene was on a roll and we finished up signing and certifying several artifacts from his missions during our three hours together at Novaspace. Then I took Gene and the Novaspace crew out to dinner where we all traded stories for a few more hours and then it was time to head back to the hotel to pack for the flight home. On Tuesday morning, I packed up the suitcase which was now full of rocks, books and other various items acquired during my travels across Arizona and hit the road. I made a quick stop at Novaspace to say goodbye to Kim, said a quick goodbye to Gene Cernan and thanked the staff for a great time the night before. Before I end, I must thank Sally, Stephanie, Linda, Lisa and Rob for their time and attention during my stay. They were real troopers. Kim gets a special thanks for listening to me for about three hours (I thought the time went fast, but I was doing the talking). While I am thanking people there is one other person that I have to thank. Cece Bibby and I were talking on the phone during my ride down to Tucson. I got a bit lost entering Tucson and she (while in Georgia) got out her map of the USA and guided me to my hotel. I might still be driving around looking for the damn place if it had not be for Cece's guidance. Then it was time for the hour and half drive back to Phoenix and the flight home ending a wonderful weekend of Meteors and astronauts. This is one of those pieces that does not have a direct relationship to the race to the Moon. It is the indirect relationship that makes this item so interesting. 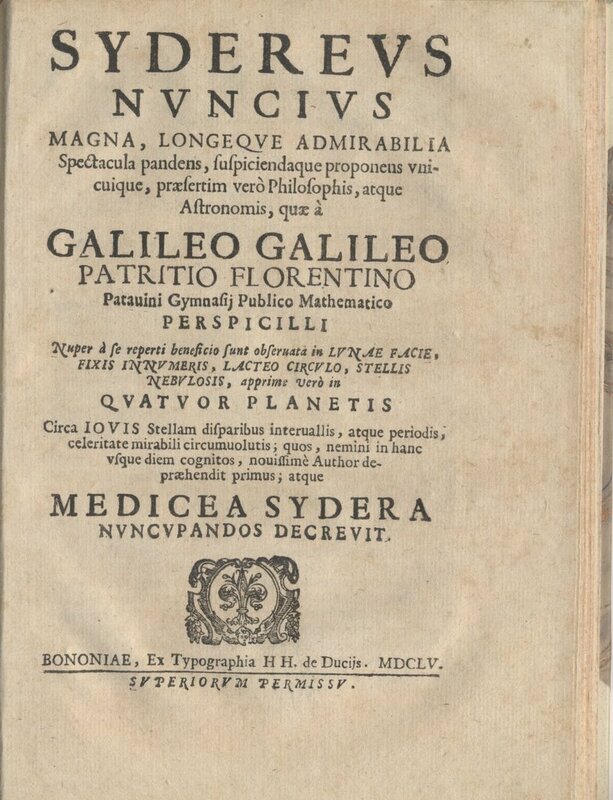 The history of Sidereus Nuncius (The Sidereal "Starry" Messenger) starts in 1609 when Galileo Galilei improved the spyglasses that were being built in Holland. Pointing his new instrument to the sky, Galileo found new sights in the heavens. Mountains on the Moon, fixed stars in the Milky Way and four moons of Jupiter revealed themselves to Galileo. 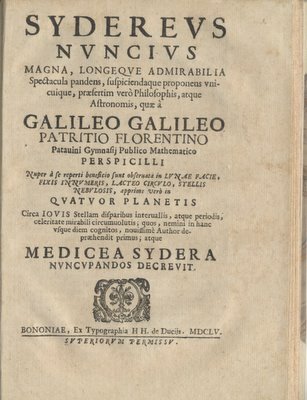 Galileo wrote and published his findings in Sidereus Nuncius in 1610, which became one of the most dramatic scientific books ever published. 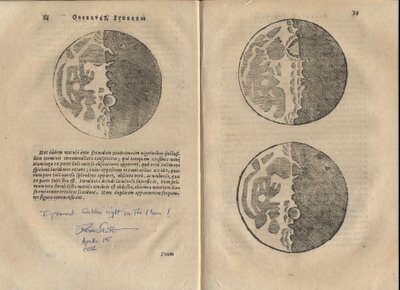 Galileo's discovery of mountains on the lunar surface, which had so long been traditionally thought to have a smooth surface, was pictured in his book by the use of woodcuts as pictured on the pages above. So we have the mountains on the Moon. Galileo was also known for his scientific experiments with gravity in which he dropped two objects of different weight from a height and they hit the ground at the same time. This demonstration illustrated the effects of gravity. How does this all relate to Apollo? 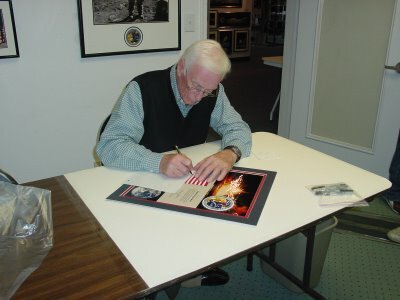 David Scott commanded the Apollo 15 mission to the Moon. The Lunar Module "Falcon" landed near the Hadley Rille in the Apennine Mountains region on the lunar surface. At the end of the final EVA at his landing site on the Moon's surface, Colonel Scott paid tribute to Galileo Galilei and science, by duplicating the same experiment in an actual vacuum on the Moon. Scott dropped his geology hammer and a falcon feather and they hit the lunar surface at the same time, thus proving Galileo right. 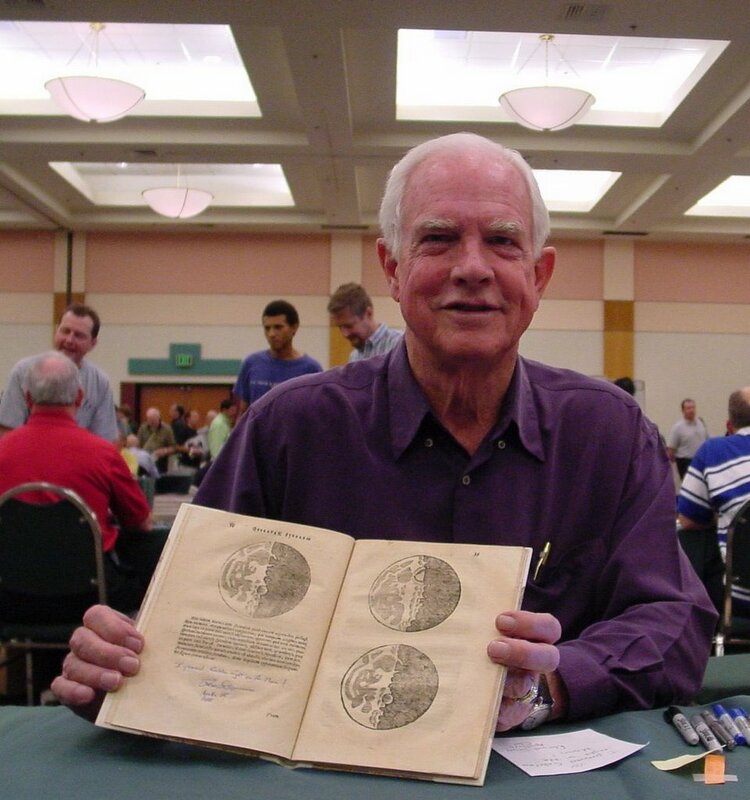 At Burbank in 2004, I asked Colonel Scott to inscribe my 3rd edition of Sidereus Nuncius (published in 1625). He turned to the woodcut pictures of the Moon's surface in the book and wrote, "I proved Galileo right on the Moon!" 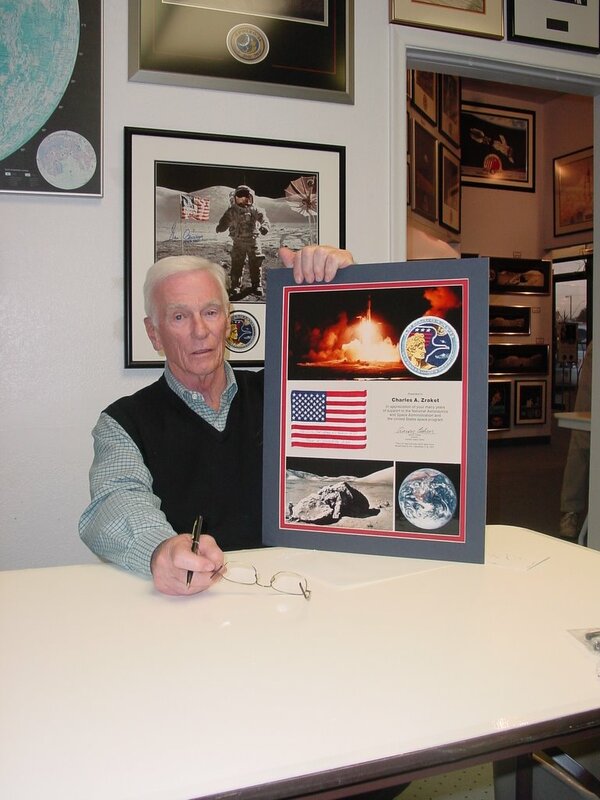 He signed David Scott, Apollo 15, CDR beneath the inscription. Sometimes unrelated pieces have something in common. The trick is to find that relationship. These next two photographs are of a hand wired circuit card retrieved from the Liberty Bell 7 capsule after it was recovered from the ocean in 1999. Since most of the people who will read this know the story, I won't go into it here. I do recommend to anybody who is interested in the story to pickup "Lost Spacecraft, The Search for Liberty Bell 7" by Curt Newport. In 2004, I was able to collect the circuit card you see here directly from Curt. The artifact measures 4" x 8". Curt was gifted several pieces of the capsule that could not be restored during the restoration of the capsule at the Kansas Cosmosphere. 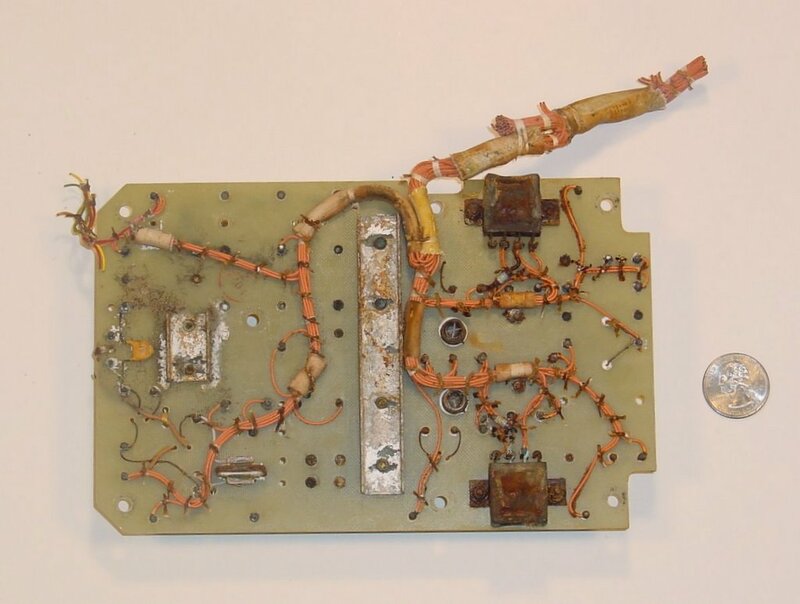 Although this is not directly from the Apollo program, this artifact is part of the race to the Moon and, more importantly, I like it, so that is why it is on this blog. 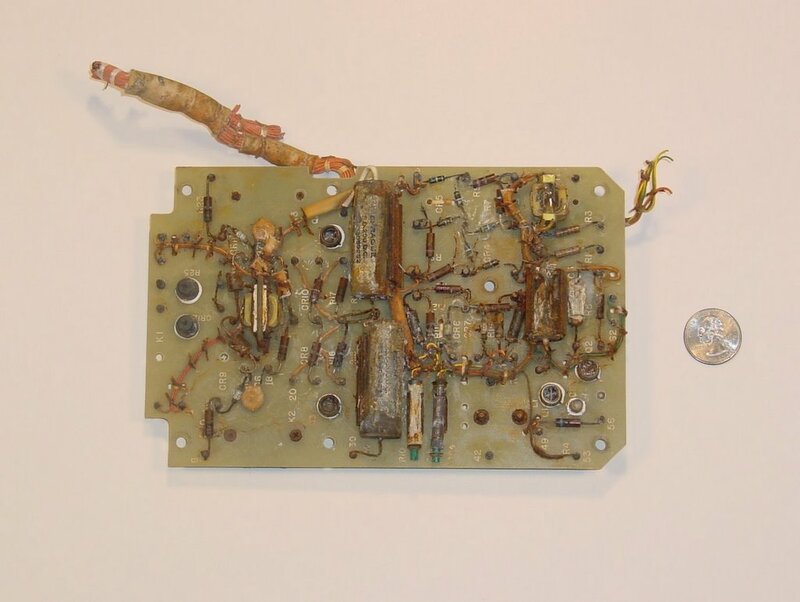 By looking closely at the front and back of the circuit card, the wire bundles are all handmade, wrapped and attached to various points on the card that contain resistors and capacitors. Looking even more closely at the front of the card in the first photograph, the damage caused by the pressure and contact with the seawater for 38 years is very evident. One of the capacitors is crushed by pressures that are known to be approximately 6,000 psi at 16,000 feet below sea level. Rust and corrosion are evident too. In 2005, I drove down to New Jersey to meet with Curt Newport, the expedition leader of the Liberty Bell 7 recovery effort and author of "Lost Spacecraft" and photograph him with the card. The above photograph also shows a preliminary painting showing the moment the ROV shined it's lights on the Liberty Bell 7 at the bottom of the ocean. The study was used to create a painting commissioned and owned by Curt entitled "Moment of Discovery." 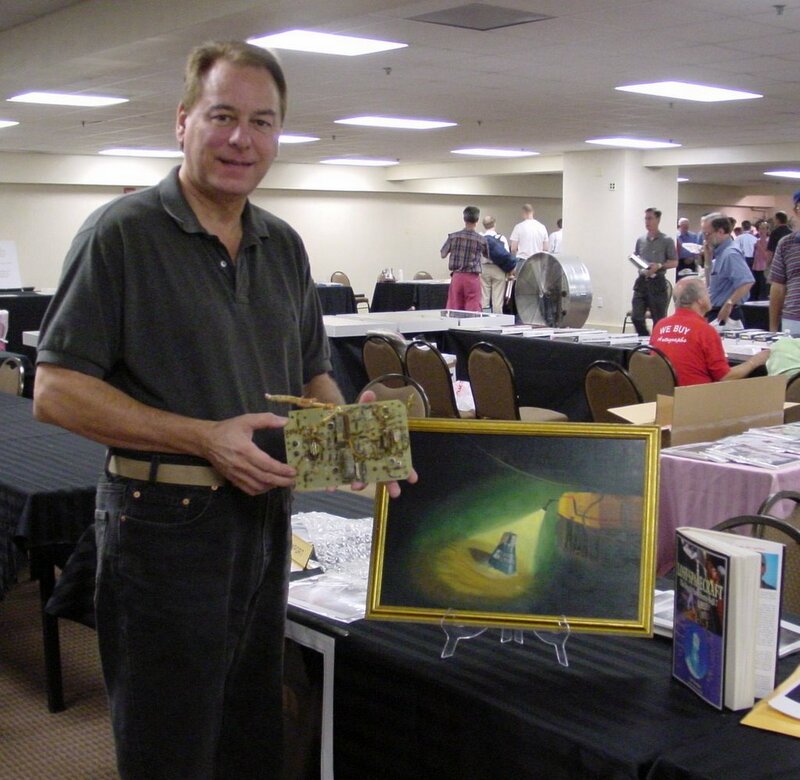 You can also see a copy of Curt's book, "Lost Spacecraft" in the photograph too. While I was in New Jersey with Curt, a gentleman and his family came up to meet Curt. 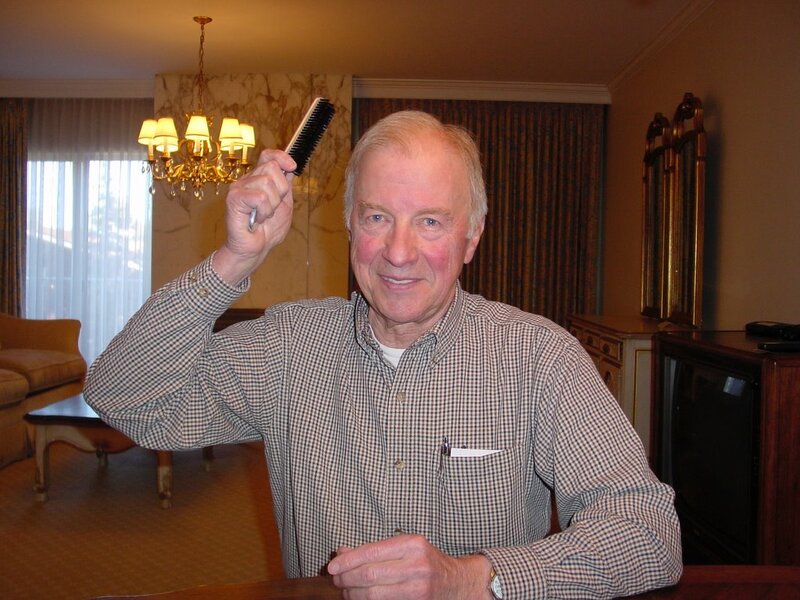 The man was a retired engineer who worked for Bendix during the time that the company was a contractor providing components for the Mercury spacecraft being built at McDonnell. Curt pulled out the card for the engineer and he proceeded to point out how the cards were made and some of the electrical components on it. At that point, I inquired if he could located the position of the circuit card in the capsule. He said that if he had the capsule schematics, then it was possible. I had brought a Mercury MA-9 Flight Director Manual containing all the hand drawn capsule schematics. Curt and this engineer poured over the schematics and actually located the position of the card in the spacecraft. It was part of the guidance system attached to the Reaction Control System (capsule thrusters). The Liberty Bell 7 story fascinates me as its combines two of avocations that I enjoy, wreck diving and space artifact collecting. Where else can you find an artifact that flew above Earth's atmosphere and sunk to the bottom of Earth's ocean in a matter of hours? No other recovered manned spacecraft can make that claim. As we know one artifact leads to another. I usually try to procure artifacts that relate to each other. In 2004, I purchased the Snoopy painting. In 2005, Fred Haise put a flown Snoopy pin up at the annual Swann auction. The relationship between the two pieces made it an excellent idea to mate the two pieces together in a display, so I picked the pin up at the auction. The pin is Snoopy's likeness in a spacesuit and helmet. Snoopy is carrying an environmental unit designed to keep the astronaut comfortable while in the suit. The pin was designed as a lapel pin and, as such, is very small at approximately 1/2 inch in length. The pin came in a plastic presentation box. 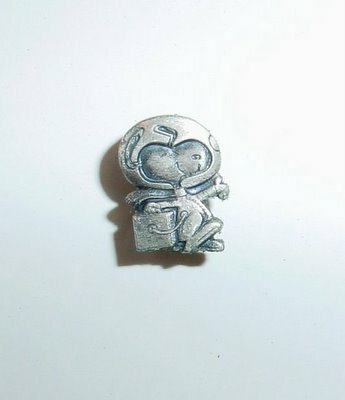 The pin would be given to a NASA employee who's effort in the workplace was deemed by the astronauts as worthly enough to be awarded the a flown "Snoopy." 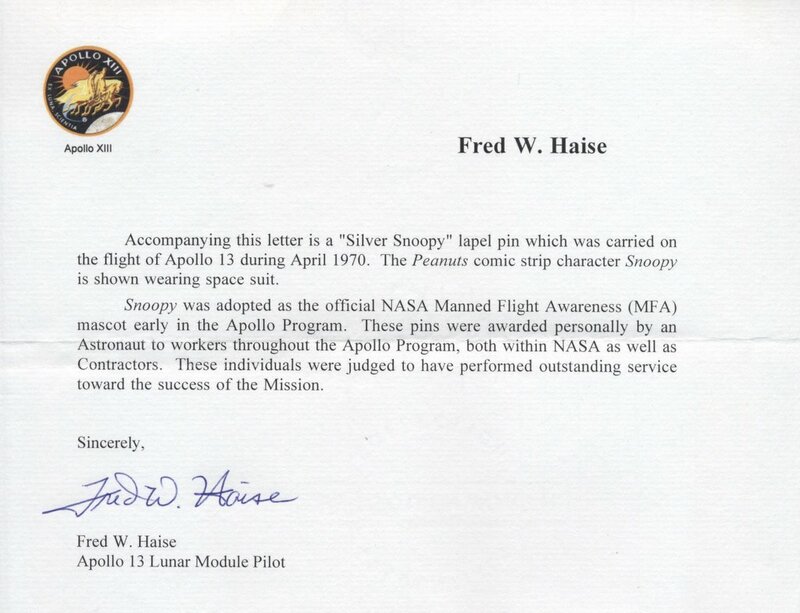 Fred Haise's description helps explain what Snoopy came to symbolize as a mascot for safety in the workplace and the manufacturing of manned spacecraft for NASA in the 1960's and today. It is truly an honor to an employee who is awarded the "Snoopy." On a more personal note, recently my wife gave me a Omega Speedmaster as a birthday gift. The wristwatch is a limited edition NASA Snoopy chronometer with the spacesuited Snoopy dancing his way to the stars in full color on the backplate.